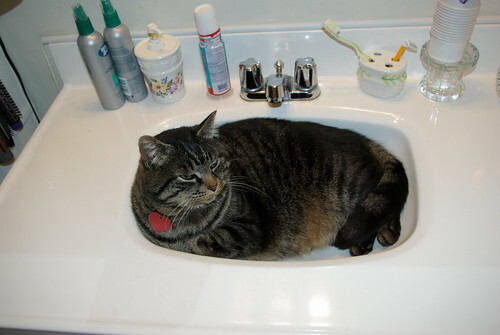 Ziggy In the Sink, a photo by Gamethyme on Flickr. My mother feeds some of the local cats by her house, and one of them recently had a litter of four kittens. She said that the kittens look to be about 3-4 weeks old, and the mother is still around. It looks like they've been living under my mom's house (there's a pretty sizable crawl space there), and Mom's concerned that they may be in danger from the local raccoons and possums, or the cars that drive by the front of her house. Mom's called the local shelters, which are saying that they're full, since it's kitten season. My question is, do you know if there's anyone who fosters kittens in the Tigard, OR area? Or any other help you could give would be greatly appreciated. While my mom's taken care of cats for a long time, she's never had such young kittens before. She said that they run away from her, so she doesn't know if she would be able to trap them and bring them inside. She also said that the mother cat appears to be taking care of the kittens with no problem, but she's worried about when the kittens will be roaming on their own. Any help you could give would be greatly appreciated. And to make it legal, here's one of Mom's other cats, Ziggy, in his favorite spot in the house. Updating to include a few pictures of the Mama Cat under the cut!